Last February the friend who introduced me to my first Corokia more than fifteen years ago (See Blog April 20th) came to visit me. I told her of my intention to apply for a Corokia National Collection and showed her all the plants I had acquired in the last few years. She was suitably impressed and told me to go for it. She then drove back to Suffolk. I also went out leaving my mobile behind. Within minutes of my return home my mobile rang, it was my friend: “Mona, I’m in Waitrose near Ipswich.” ‘So she is shopping in Waitrose, why is she telling me this?’ I thought. “Yes…?” I said.”The thing is there is a plant stand in front of the store, and they are selling Corokias. 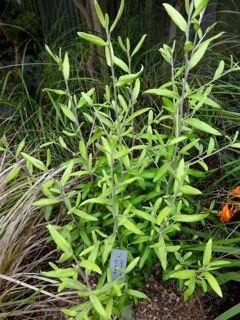 They look different from the ones you showed me…The label says Corokia “Limey”,she replied. “There is no such Corokia in existence,I should know!” I said rather tersely. “Well, that’s what it says,do you want it or not” she countered.” “Of course get them anyway,please,” I said. She brought them down to London the following week.In all my research I had never come across a Corokia ‘Limey’. After peering at the label through a magnifying glass for a considerable amount of time I finally came across a website address in minute print: www.sonkoot.nl which proved to be a very large nursery in Holland.I rang them immediately,they were most charming and helpful and they confirmed that they had indeed introduced this brand new Corokia hybrid “Limey’. Moral of the story: The most exciting new discoveries hang by a thread, or rather by a few minutes. Had I not returned home when I did, my friend would not have been able to contact me, she would have left Waitrose without my precious new Corokia, and I would not have acquired this exciting new plant to add to my collection, or discovered this Dutch nursery which incidentally has introduced other new Corokia hybrids.